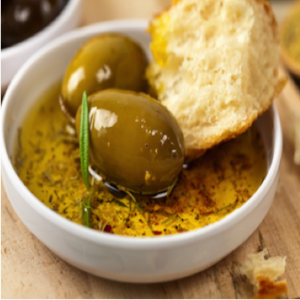 There is nothing better than good black olive sourdough bread with olive oil dipping sauce. And although there are a variety of ways to make these tasty comfort foods, we have shared a few recipes that we personally are considering making ourselves. We LOVE to cook at My Olive Tree, so when we first began the process of producing extra virgin olive oil, made in Israel, I’m sure you can imagine our excitement. We are so proud of our olive products, not just because they are delicious, but because ALL of the proceeds we receive from them go towards funding important humanitarian outreaches in the nation of Israel and beyond. We hope you enjoy these recipe recommendations, and would truly enjoy hearing from you! Let us know if you have other favorite ways to make this awesome duo. Add into one bowl the flour and the salt. This is your dry mixture.In another, larger bowl mix the water and the sourdough starter. This is your wet mixture.Add the dry mixture to the wet mixture and mix until it all comes together. Cover with a plastic wrap and let it stand for 10 minutes. After 10 minutes, add the pieces of olives and knead the dough in the bowl, by pulling one portion of the dough from the side and pressing it down in the middle. Repeat, turning the bowl slightly at each kneading, doing this kneading motion about 8 times and covering the full circumference of the ball of dough. The whole process should take about 20 seconds. Cover the dough again and leave it resting for 10 minutes. Repeat this kneading cycle three more times, 10 minutes apart. Cover the bowl and let it rest for one hour. Turn the dough onto a floured surface, and shape it as a round ball, coat the surface lightly with cornmeal or rice flour, and place it in a suitable container for the final rise. Let the dough rise until doubled in size, which should take from 3 to 6 hours, depending on how active your starter was. Heat the oven to 475 F, and have your method to generate steam ready. Slide the bread on a parchment paper or a wooden peel, slash it, and place it in the oven. I like to bake it over tiles, and place an inverted roasting pan moist with hot water over it for about 30 minutes, then remove it. Once the bread is in the oven, reduce the temperature to 425 F. Bake for a total of 40 minutes, or until the internal temperature is over 200F. To make the dipping sauce, place the oil at room temperature in a shallow bowl or decorative plate. Swirl a drizzle of balsamic decoratively into the center. Sprinkle with the pepper flakes, salt, and ground black pepper, and top with a light coating of cheese.